To Calgary and back, and my signature Olympic moment came in Circle, Mont. Every couple of years, when the Olympics roll around, and especially every four when they’re the Winter Games, I think about what I learned as a broke college student in 1988. Turns out the Olympic spirit isn’t so much about amazing achievements and grand triumphs, but about everyday kindness and a cup of coffee over a hot breakfast. 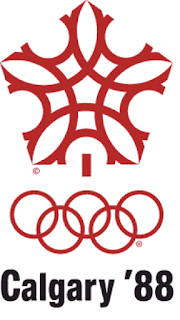 Here’s my Olympic story, which The Forum, Fargo, N.D. first published under the headline, “Reliving the spirit of Games,” on Feb. 19, 2010, during the Winter Games in Vancouver, British Columbia, Canada. We took off for Alberta two weeks later with no plan, no idea where we’d stay and no clue how we’d get event tickets. No matter. When would we ever have that chance again, with the Olympics within driving distance, time to take advantage and nothing but getting there to worry about? Never. We drove all night with the lights of cities like Moose Jaw, Swift Current and Medicine Hat illuminating the cab, and wound up in a fleabag an hour from Calgary, the closest motel with any rooms to rent. With scalped tickets we saw bobsledding, ski jumping and even a little hockey history when Finland beat Russia 2-1. The following year the Berlin Wall fell, marking the beginning of the end for the U.S.S.R. Turned out the loss was the final Olympic hockey game for the Big Red Bear. I’ve tried to explain the feel of a city in the midst of an Olympics many times, never with success. Saying there is a palpable sensation of goodwill is cliché, but true. Days were thousands of people from dozens of nations mingling and cheering, making new friends, soaking it all in without a hint of animosity, pettiness or rude behavior. Nights the city danced in and out of clubs and restaurants, with dozens of languages floating through the air and the people of one world savoring the moments. We hit the road for home, fresh with the spirit of the games, broke and happy. We pushed the old car down Highway 2 in Alberta and hit Montana in the dark, dodging jackrabbits with The Doors blaring through the speakers to keep us alert through the long miles. Circle, Mont., population around 550, is not a place to run out of gas in the middle of a cold, March night. Or so I thought as we drove up and down the town’s main drag in the wee hours. Finally, we pulled off in a local churchyard, broke out the sleeping bags and bedded down on the frozen ground. I woke to muffled murmuring and peeped out the tiny hole of my mummy bag to see several men gazing down, debating what to make of the two strangers lying on the ground. Turns out they were the church’s council members gathered for their monthly breakfast meeting. After we explained who we were, where we’d been and where we were heading, they invited us in. I’ve never tasted pancakes and sausage so good, and the opportunity to talk about what we’d just experienced was even better. Certainly, “faster, stronger, higher” captures the athletic prowess and drive for perfection of the Olympics, but the games are more than that. They are an opportunity for the world to gather in peaceful competition and camaraderie. It is an occasion, if you will, to invite an outsider in for a warm meal. In one of those ordinary, everyday miracles that Sarah McLachlan sang about in the 2010 opening ceremonies, I found the Olympic spirit in Circle. We left, gas tank and bellies full, with a memory that eclipses the event that drew us out of Fargo, N.D. in the first place. For me, 22 years later, the Olympics are still about a warm cup of coffee, a smile and, most importantly, kindness to a stranger.